In the same way that many of us wear logoed clothing to show pride in our school or team, company apparel similarly expresses that you are proud to be a part of your organization. Branded company apparel communicates pride and confidence to customers, prospects, vendors, and anyone with whom you interact. Just as importantly, it engenders pride among employees: An employee is more likely to feel and demonstrate pride when they see their co workers doing the same. In the 21st century, where new companies are launched every day, credibility is as important as ever. For example, if you are meeting with prospective customers who may not be familiar with your company, a company apparel item as simple as a dress shirt, screen printed t-shirt or jacket with your embroidered logo makes your company more real and tangible in their minds. That’s not to say a company shirt is sufficient to establish credibility, but it plays a big part in helping to make an impression. In the same way that your products, services, and marketing activities shape your company brand, your company apparel can also reinforce the image you want to convey. Whether you are going for “innovative”, “fun”, “dependable”, or “prestigious”, the type of apparel items you choose, and how you embellish them, can compliment your brand messaging. Furthermore, when employees are donned in embroidered company-branded apparel, they are more likely to be aware that they are representing the company and behave in a way that is consistent with the company’s values. Did you know that putting a logo on company apparel could be so powerful? It’s important to understand the effects that your branded apparel can have, so you will select items that are the best fit for your business. There are many types of company apparel to choose from, and a variety of ways to embellish them. So, how do you create custom apparel that’s right for you? 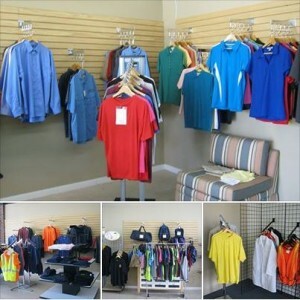 We can help you choose your new business apparel. With our Company Apparel and additional Clothing & Accessories, we can help you look good while facing your day. Whether you’re looking for embroidered shirts for your staff or you’re trying to get embroidered jackets for your sports team, it’s easy to get your company or team logo embroidered on our Corporate and Casual apparel. Be sure to contact Spotlight Apparel, Inc. of Jacksonville Florida for all your company apparel. Posted in Embroidery, Screen Printing and tagged business shirts, company apparel, company shirts, company shirts jacksonville, company t-shirts, company tshirts, corporate apparel, tshirts jacksonvile.